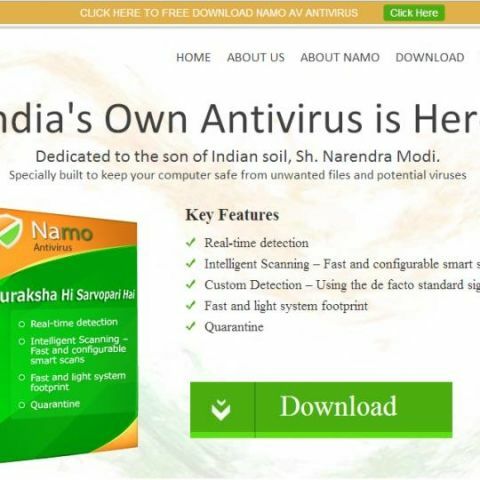 NaMo anti-virus software will provide free protection to PC users against malware. Indian IT firm Innovazion has named its new anti-virus software NaMo. The free software will provide protection against malware and virus attacks. The Namo anti-virus software comes with features such as real-time detection of infections, custom detection, intelligent scanning, and is light on hard drive according to the company. The anti-virus software offers basic protection to PC users currently, but the firm is also planning to launch advanced versions of the software for Apple's Mac computers. The current software is also expected to get regular updates. “India is the third largest country globally in terms of Internet users. However, statistics show that only 13 per cent are using valid license of antivirus software and 30 per cent tend to re-install trial versions of same or other antivirus software,” Innovazion CEO Abhishek Gagneja stated in an interview. He added that the remaining 57% systems either have no protection or are using unknown applications for protection of their devices and this is the segment that NaMo AV is targeting. Gagneja, stated that the company has no association with any political party or its leaders. “By building this software, we wanted to … congratulate the current government. We also want to pass a message to the government that the nation has high expectations from them,” he said. Innovazion started in 2007 and has a presence in seven countries including the US, the UK, India, Germany, Romania, Canada, China and Singapore. The company has over 500 employees and its primary services are application development, IT infrastructure management, business consulting and marketing research. Gagneja stated the company would continue to offer the security software for free. "We have other businesses that are doing well. Last year, the group's revenue was $16 million, which we expect will grow 100 per cent this year. NaMo AV will continue to be a free product," he said. NaMo followers had earlier opened a NAMO online store for Narendra Modi inspired products. “The Namo Store” sells products under three categories Namo Tech, Namo Lekh and Namo Mantra. The store offers products including jackets, pen drives, t-shirts, letter pads, paper weights, conference diaries and other stationary items. It may be recalled there are already Namo-branded smartphones and phablets in the market. which anti-virus is good for laptop?